Weather conditions can affect our day-to-day activities, calendar plans and even our mood. That's why we often watch TV forecasts or read internet weather news to prepare ourself for the day . 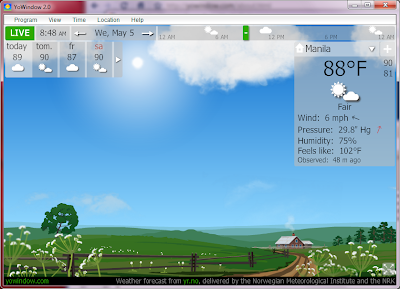 Isn't great if we can see the weather condition in front of your Windows PC? YoWindow displays weather conditions as a window on your desktop. It has a nice and peaceful landscape just like looking out of your window. YoWindow works on Windows XP, Vista and Windows 7.